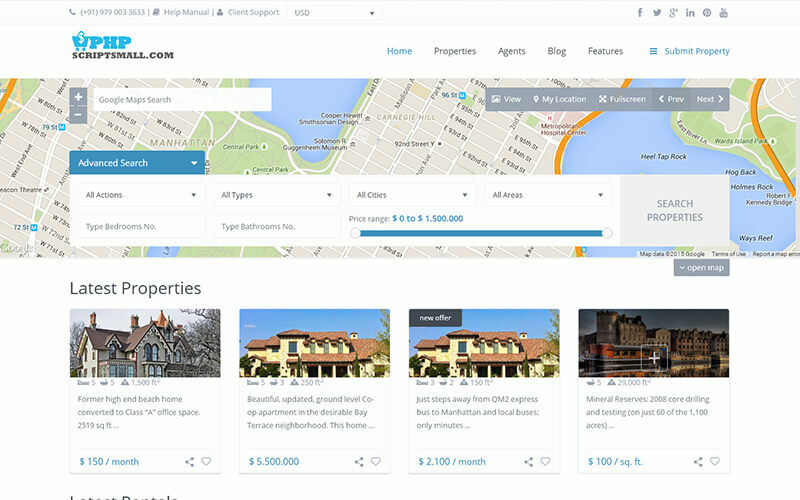 We have updated our new script for real estate industry with some premium features like, SEO-friendly URL, Responsive Design and XML Support. You can have a look, we have 4 different designs you can transform it based on your interest and your business concept as it is coded to be customizable, so you can customize with your developers. We can setup your website within 24 hours of your purchase. This open source real estate agency script is exclusively for connecting the property listers and buyers. This script is optimized for easy handling so it is highly user-friendly. Our property listing script database is highly protected with a durable security system. Anyone can list under different categories can opt for filter purpose you can choose the budget and requirements. Our property portal script can support multiple and the most popular payment gateways. Listing Script supports SMS integration to help communicate and notify your customers via SMS. Admin side has more organizable options; you can add unlimited categories, builders, agents and companies listings from the admin panel. Every user can have separate account panel to manage their listed properties and their own profile related details. We have embedded many revenue making modules in it to get some additional revenue for you. Google Ads, Banner Ads and Listing membership charges are the way to earn a lot from our revenue modules. This real estate WordPress theme completely supports all social media login this let you drive more users to your site. We know that getting your website to the employers and freelancers is necessary which is why we have made our script to be SEO-friendly by optimizing it in accordance Google standards. The best documentation I ever seen this script, this is an excellent script with rich customization and responsive features really I was very happy to found this team. Their Service was excellent and the personnel I work with great. No request is out of the question and usually can be accommodated within the current budget and in a reasonable. Very responsive team and these guys are having lot of experience in this field so they easily understand what they want to customers.